“If you had given me the opportunity to participate in today’s seminar [when I started graduate school], I would have said, ‘I don’t need a mentor, I’ve got it all figured out,” said Deondra Rose, M.A. ’10, Ph.D. ’12. Now an assistant professor of political science and public policy at Duke University, Rose returned to campus on Nov. 28 to address a roomful of graduate students and postdocs about the importance of mentoring. 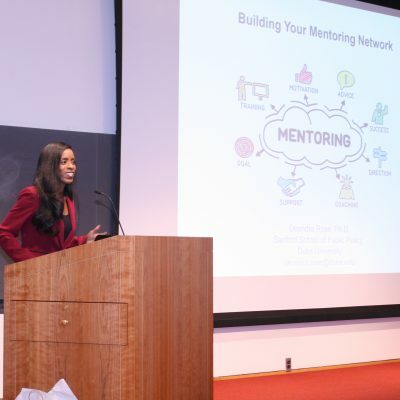 Rose’s talk, the second in the Maximizing Your Mentoring series, featured humor and anecdotes about the mentors she found throughout her academic and professional careers and the importance of finding such individuals. Rose explored how she acquired a network of mentors throughout her presentation, reinforcing the value of finding formal and informal mentors in varying career phases and from different institutions. She reminded the audience that mentors can provide insight not only into academic and professional pursuits, but in learning how to balance personal life as well. Rose left students with five “pro-tips”: develop a rich web of mentors, not just one; do not hesitate to reach out to potential mentors; share the responsibility with your mentor for staying connected; constantly evaluate your changing mentoring needs; and do not forget to be a mentor yourself. “Change is a really important factor to consider when you’re thinking about mentoring and who’s on your mentoring bench. Mentorship changes. As you progress through your career, as you progress through your time as a graduate student or as a postdoc, as a junior faculty person, as a researcher – whatever your role is – as that role continues to change, your mentoring needs will also change,” she said. According to Rose, finding mentors is an integral to graduate student and postdoc success. The Graduate School offers multiple types of programming to address the mentorship needs of graduate students and postdocs, but offering alumni perspectives can provide further benefits. “It’s really an exciting opportunity to be able to invite back alumni to engage with current graduate students and postdocs, and to share insights from their time at Cornell and through their postgraduate experiences,” said Sara Xayarath Hernández, associate dean for inclusion and student engagement. The Maximizing Your Mentoring series is a collaborative effort of the Multicultural Academic Council and the Graduate School Office of Inclusion and Student Engagement.